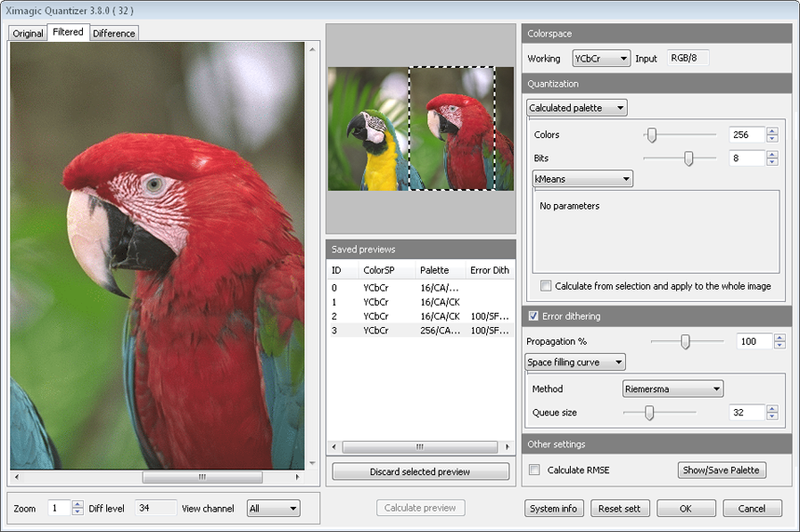 Ximagic Quantizer is a Photoshop plugin for image color quantization (color reduction) & dithering. * 10 calculated quantization methods. * 2 error diffusion dither methods. o 8 Array patterns (floyd-steinberg, ulichney, fan, jarvis, stucki, sierra). Support of 8/16 bits images. Important: It reduces the number of colors in a image, but doesn't change a RGB image to indexed color. If you want to use it to change an image from RGB to index color, you should use your image tool to change the image mode, after running Ximagic Quantizer. Color quantization & dithering of images is an old field in image processing. There are a lot of algorithms and implementations, but there is not a method which is the best for everything. Moreover, color reduction and dithering can be used for several purposes, not only to palletize an image and even to palletize an image the best method can be different for different images or palette size. Ximagic Quantizer try to include the most known methods of Color quantization and Dithering, and allow the user to choose which one to use. The most used method, gives usually a good results and can be used sometimes without dithering. Octree algorithm is really a family of algorithms. The one included reduces the tree lowest-population first and can be used in one pass, building and pruning the tree at the same time, or in 2 passes first building the tree and then pruning it. The result of the two pass method is better. Method using Kohonen self organizing maps. Usually the best one according to RMSE. Method for simultaneous quantization and dithering. Very good for small palettes, 16 colors or less, when other methods even with dithering don't work well. <em>Note:</em> All methods excluding SColorQ give the same result for the same image and parameters. SColorQ starts with a initial palette filled with random values, which change with time, and so it gives different results in each run. The plugin could also calculate RMSE (Root Mean Squared Error). Although this value is not equivalent to visual quality, it is generally accepted as a good measure of the quality. To get the RMSE mark the "calculate RMSE" check.